Epidemiology, outcomes and prediction of severity in acute pancreatitis in the UK as classified by the revised Atlanta guidelines. At: Panhellenic Surgical Congress, Thessaloniki, Greece; 2016. London Surgical Research Group: James B Haddow, Marianne Hollyman, Sarantos Kaptanis, Jennifer Watt, Hemant Kocher, Greta Mclachlan, Kanishk Shah, Hew Torrance, Jessica Chang, Constantine Halkias, Salim Tayeh, Mohammad Rafiz Imtiaz, Amandine Woodham, Chee Wan Lai, Nick Newton, Rosie Worrall, Jason Lewis, Jane Turner, Phill Pearce, Todd Leckie, Alexander Allen, Anna Wright, Ifeoluwa Ogunrinde, Andrew Healey, Sameh Farag, James Hollingshead, Francesco Pata, Alicja Psica. 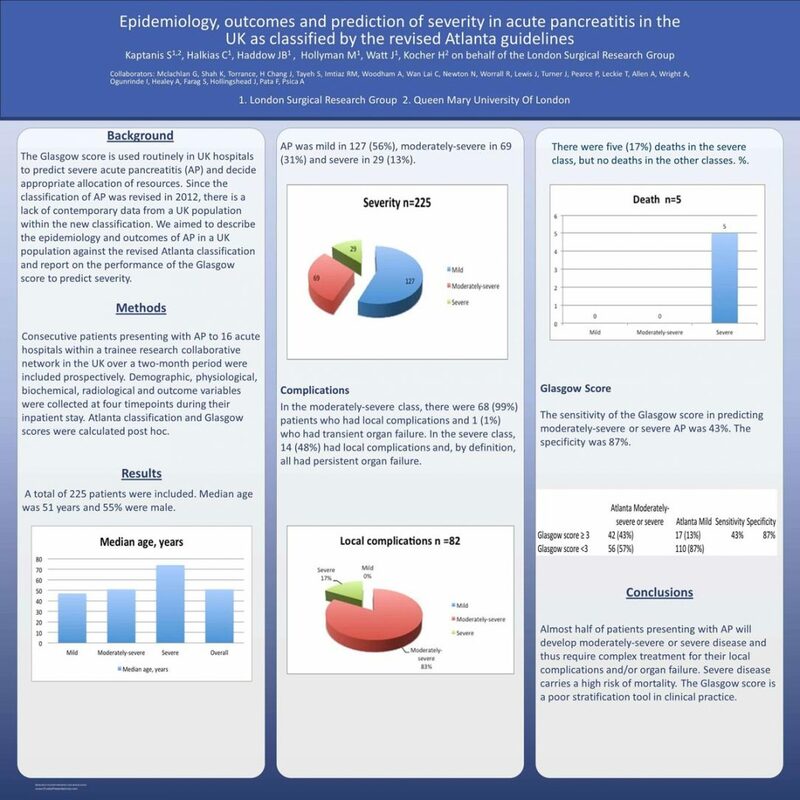 Home » Portfolio » Epidemiology, outcomes and prediction of severity in acute pancreatitis in the UK as classified by the revised Atlanta guidelines. At: Panhellenic Surgical Congress, Thessaloniki, Greece; 2016.